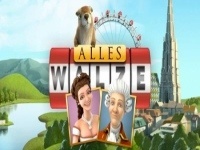 Play the new German/Austrian slot of elegance and prestige in Alles Walze, a 5-reel, 25-payline video slot! This wonderfully animated slot has a fun soundtrack that sounds like it came straight out of a classic cartoon show, but the animations and graphics are next to none having been developed by Rabcat for the Austrian Win2Day Casino. What happens when two star crossed lovers meet on a picturesque balcony in Austria? Well they engage in the Walze of their lives. Game symbols include the female and male lovers, a gopher, the Austrian flag, a latte, grapes, a goat, a schnitzel, chocolate cake and more. Wild Symbol: The White flower is the Wild and will substitute for all other symbols except the Jackpot symbol and Free Spins Symbol to complete winning combinations when possible. Jackpot Symbol: The Jackpot symbol is represented by the Euro cash symbol on the European flag. Hit three or more to trigger the Jackpot by varying percentages. Getting 2 or more Free Spin Austrian flag symbols will guarantee you a win but hitting 3 or more will win you10 Free Spins on top! Aztec's Millions - Progressive 25 Line Slot from RealTime Gaming. PayDirt - Progressive 25 Line Slot from RealTime Gaming. The Great Galaxy Grab - Bonus Feature 25 Line Slot from Microgaming. A Night Out - Bonus Feature 20 Line Slot Machine. Karaoke Cash - Bonus Feature 20 Line Slot Machine. Samba Nights - Free Spins 50 Line Slot Machine.